“He’s a triple threat in science,” Bond Life Sciences researcher David Pintel said. Donald Burke’s combination of scientific excellence, caring mentorship and devotion to the University of Missouri led Pintel to nominate Burke for the 2017 William H. Byler Distinguished Professor Award. The university agreed, awarding him the honor in October. The University-wide accolade recognizes a faculty member for their “outstanding abilities, performance, and character.” When Pintel read this description he said he instantly thought of Burke. This is the first time a faculty member from Bond LSC has won the award. Pintel said the award shows the quality of people here and the department is proud of him for receiving it. Burke is a Molecular Microbiology & Immunology professor. His lab in Bond LSC studies RNA, the molecule used to help cells copy genetic information from DNA. For Burke, the award is an honor. “You always try to do everything you can to contribute to making the place great and you don’t do it for the purpose of being recognized, yet when the recognition happens, it’s nice,” he said. Burke’s lab hosts students from the high-school to post-doctoral level. For each member, Burke said he tries to figure out their motivation. He starts by just asking questions and is able to align their goals and his. He said that challenge has paid off because every student that has gone through his lab has taken his science in new directions. Pintel said this connection Burke has with his students is easy to see. During their time in his lab, Burke tries to teach his students the importance of working as a team as well as learning understand the research process. Recently, Burke has expanded his passion for motivating others to a new area. 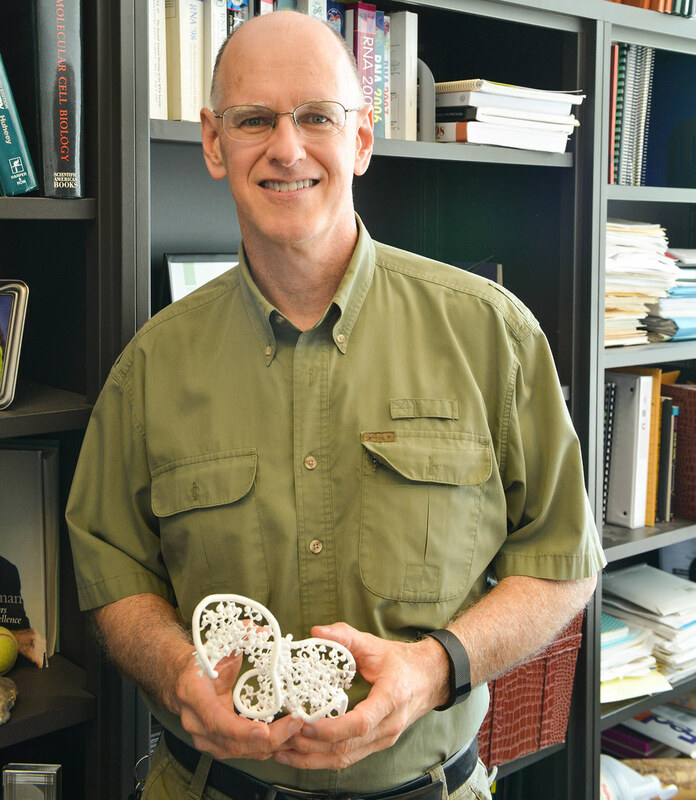 In July, Burke became the Interim Chair of Molecular Microbiology & Immunology. “Now that he’s the interim chair he is trying to provide the same kind of supportive environment for the department that he’s been doing for his lab,” Pintel said. Burk said he wants to help other faculty members achieve their goals and prioritize tasks. He is also involved in a new faculty search where he works to ensure the applicant pool reflects those that might be wanting to apply by removing language that may prevent people from applying. “Again, I want to help find what obstacles can be in their way and get rid of those before it slows them down,” Burke said restating his passion for helping others achieve excellence. Donald Burke-Aguero is an MU professor in the Department of Molecular Microbiology & Immunology. He received his bachelors’ degree from the University of Kansas and his Ph.D. from the University of California, Berkeley. Burke joined the MU community in 2005.